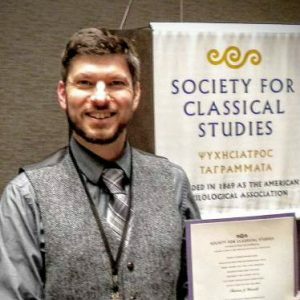 NORTHAMPTON — Northampton High School Latin teacher Thomas J. Howell recently won national recognition for his work from the Society for Classical Studies, a major academic group focused on ancient Greek and Roman languages, literatures and civilization. At the group’s annual meeting in early Janurary, Howell was given one of two awards for Excellence in Teaching at the Precollegiate Level. At most, two people win this award each year and take home a prize that includes $500 and an additional $200 for educational materials.